The 6,000 sq ft facility includes a five-foot mini-ramp, two quarter pipes, a rollover hump, a spine, and rails. Approx. cost was $17,750. 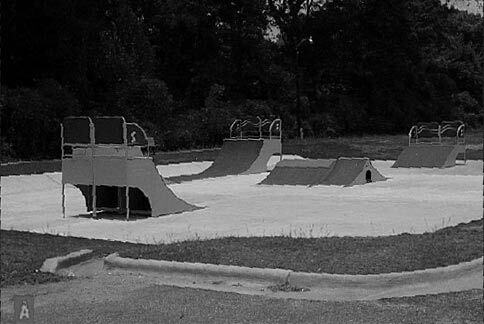 Auburn plans to expand use of the skatepark by attaining a grant for the purchase of additional equipment by September 30, 2006. The skatepark was created using materials from Skatewave, a manufacturer of skatepark components in Delano, MN. The materials are made of steel construction and are mobile so the park can be reconfigured. Becky Richardson, Director of Auburn Parks and Recreation, and Susie Thomas, Chairman of the Auburn Parks and Recreation Advisory Board, began researching skateparks in 2001. They visited several surrounding cities with skateparks and met with several skatepark developers. Phil Dunlap, Auburn Parks and Recreation Special Programs Director, chaired a design committee composed of skaters from middle school to college age and a local skate shop owner. "This park is an excellent addition to our community and I am proud to have played a role in its development, " said Phil Dunlap. "Auburn Skatepark has been well received. The skaters and bikers seem to be enjoying themselves, and we are pleased with the response," said Parks and Recreation Director Becky Richardson. Restroom facilities are available at Frank Brown Recreation Center. Helmets are required to participate and failure to wear a helmet will result in removal from the park.